how to read, in the way musical notation directs a musician how to play." How do you punctuate quotes? I hope the answer to that question would be, correctly. But, as I travel around the web I find that isn't always the case. Here are the rules, so that as we blog or write our family histories we will always get it right. Quotation marks are used to set off dialogue, quoted material, titles of short works, and definitions. Do not use quotation marks with quoted material that is more than three lines in length. In this case the material should be indented in what is called a blockquote. Use quotation marks to set off a direct quotation only. "When will you arrive?" Mom asked. Mom asked when you will arrive. Where a single quotation mark is nested within a double quotation mark, the punctuation is inside the single quotation mark. Periods and commas always go inside quotation marks, even inside single quotes. The sign changed from "Walk," to "Don't Walk," to "Walk" again within 30 seconds. Mom called to Susan, "Hurry up." Susan said, "Mom said, 'Hurry up.'" If the question is within the quotation marks, the question mark should be placed inside the quotation marks. Mom asked Susan, "Will you be home after school?" NOTE: Only one ending punctuation mark is used with quotation marks. The stronger punctuation mark wins. Therefore, no period after prepared. When you have a question outside quoted material AND inside quoted material, use only one question mark and place it inside the quotation mark. Did Mom say, "Will I be home after school?" An exclamation point should be placed inside quotation marks only when it is part of the quoted matter, just as the rule for a question mark. She actually wants me to believe the manufacturer’s claim that her watch is “water resistant to 300 meters”! When a colon or semi-colon appears at the end of a quotation, put it outside the quotation mark. John Wayne never said, "A man's gotta do what a man's gotta do"; however, he did say, "A man ought to do what's right." "Now go out there and quote with wild abandon!" fM said. punctuation varies in other countries. "Quotation marks relative to other punctuation and text," The Chicago Manual of Style Online, accessed August 22, 2010, http://www.chicagomanualofstyle.org/. "Quotation Marks," GrammarBook.com, accessed August 22, 2010, http://www.grammarbook.com/punctuation/quotes.asp. I believe commas and periods inside quotation marks is an American-only style. 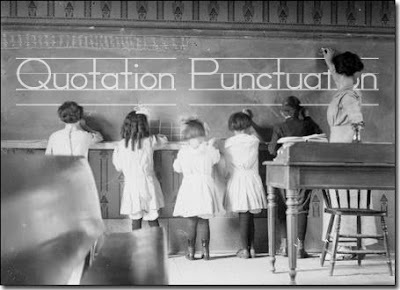 I've heard British, Canadian and Australian writers of English put punctuation outside quotation marks. And the Brits drive on the opposite side of the roadway, and spell color differently! Their car has a boot rather than a trunk and they lift the bonnet to check the engine. Thanks John, I've added the disclaimer. How US centric of me! ROTFLMAO! Oh, Sheri, you've got it going on. Yes, this could become a colourful comment meme. OK, I hate this subject! LOL. I swear I learned it differently, and I know I NEVER get it right! This post will get bookmarked for future reference. Did I get it correct this time?? "Bravo!" And you can quote me. I also learned that there is no "s" on toward, yet it seems that has fallen by the wayside. Now, fM, if folks would only actually QUOTE rather than just use the work of another without attribution. THANKS for the refresher course. Thanks for your article... I thought I knew all the important punctuation rules and I did... I just had some of them wrong! Thanks for reminding me of these correct ways to punctuate.